I usually prioritize protection over beauty whenever I purchase an iPhone cover. That is precisely why I am such a huge fan of Tech21 (see review here) and Ballistic (and here) cases. SwitchEasy Shades is UV Scratch Resistant. It also allows you to enjoy full 360° protection via an extra thick casing made from Super Strong Polycarbonate and Thermoplastic Polyurethane. It comes with 2 screen protectors, a Microfibre wipe and 2 connector protectors so dust doesn't get in your headphone and charger ports. It is probably the most posh looking iPhone case I have ever owned and it also performs and functions seamlessly. It has a good, snug fit + the buttons remain tacky and responsive despite the thick layer of protection. And here's an added bonus. The power button of my iPhone 5 has been broken for the longest time. (I heard this is a common problem for this particular model.) I took it to Power Mac for assessment but they told me that it would take approximately a month before it gets repaired. Because of the hassle, I decided to just live with it and rely on the assistive touch feature. But guess what...for some reason it started functioning again when I changed my case to this one. I can't tell you exactly what made it work but it did and I am ha-aa-ppp-ppyy! SwitchEasy is distributed in the Philippines by Digits Trading and is available at Beyond The Box and Digital Walker Boutiques. 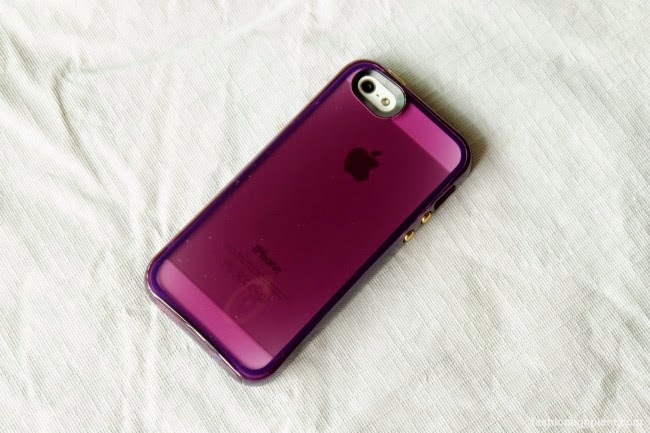 I so love the case especially the color! Love how simple and classy the casing looks, Sarah!